When Christians disagree… not if, but when, because we already do. Dip me in a pool? Mist me three times? Is it His body; is it not? What’s that funny language you’re speaking to me in? Can my wife preach a sermon? Can I mow my grass on Sunday? Am I looking for an anti-christ, or has he already been here? Did God do all of the work… or must I make a choice? What’s that antiquated robe your preacher wears? Old hymns? Contemporary praise? Red carpet, green carpet, shag carpet, blue, there’s much, much more, shall I continue…. When Jesus petitioned this prayer, “…that they may all be one, just as you, Father, are in me, and I in you, that they also may be in us, so that the world may believe that you have sent me (John 17:21),” did He envision the segregated Christian community that bears witness of His gospel in the world today? Many of us find ourselves in one of two categories when handling all of the disagreements among professing believers: those who insist on a hardline approach where every belief is a gospel defining issue, and those who ignore our disagreements in the name of unity. I believe an argument can be made that neither position is biblical. Wisdom is of course found in our discernment of knowing which disagreements belong in which category. In such wisdom… who knows, we may find unity. By the way, some excellent conversations on this topic have been going on here at nebraskaenergyobserver and here at All Along the Watchtower. These series purpose to question the negative repercussions of our continued division. This entry was posted in Telling the Truth, WordPosts and tagged body divided, Christian, Epistle to the Galatians, First Epistle to the Corinthians, Jesus, Paul. Bookmark the permalink. 17 Responses to Friday Night Smack Down …in the Pews? I have worked with people from many different denominations over the years. We agree on all the basics – authority and inerrancy of the Word / total efficacy of the blood of Christ / total inability of mankind to save themselves / salvation therefore by grace, through faith and only through Jesus Christ. There could be differences of opinion on a number of matters that don’t “matter” and sometimes we will respectfully discuss them, but they do not stop us from praying together, studying together and ministering together. Having said that, there have been times when a stand had to be made. Yes… let me repeat that, YES. I haven’t a clue what to do with our FB page. I am totally lost on that thing, Carley. I’m hoping someone can help us figure out how to make it usable and how to maneuver around it and well, anything about it! Thanks good friend and blessings. Thank you Carley and blessings as we await your soon to be here new novel! I think you’re very right. Struggling to find any positives in division here. Very good! Listen up all you “Christians”… the true example of a real Christian is not found in words from men… but ONLY from our Heavenly Father’s Holy Word! If it’s not in the Word… then you better ask the Father through our Lord Jesus what’s up! Hoping this makes sense! Thanks Jessica. Yes, the atmosphere has been very pleasant through the conversations over your way. I’m still playing catch up trying to read all of the posts and then comments and conversation. Some run pretty long… impressive. Blessings good friend. Thank you for the link, a lot of very hard thought by a lot of people went into this series of articles. We are very grateful for all of the hard thoughts… continuing to try and digest all of the knowledge imparted by both of your efforts. One of your conclusions I believe is very valid. 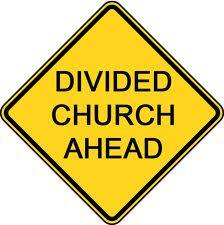 Divided we are sure to falter. The strength of a body is in its unity. Thanks and blessings good friend. We are glad to share, if fact that is why we did summarize it, and in fact are still interested in any comments anybody else has. You have taken our major conclusions already, we need to present a united front.